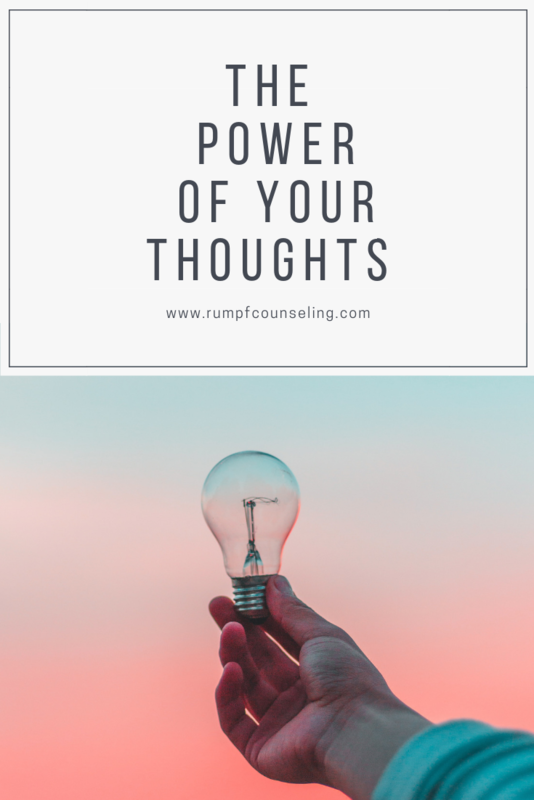 When I’m working with counseling clients, we spend a good amount of time examining thoughts. Those internal- sometimes conscious, sometimes not- beliefs, perceptions, memories. Our first job is to bring awareness to the thoughts, and once we’re there (easier said than done, by the way), we can look at the impact those thoughts are having on her life. A core tenet of cognitive behavioral therapy (CBT) is the connection between thoughts and emotions. The idea is that it’s not situations/events that cause our emotions, but rather our perception of those situations/events that lead us to feel a certain way. Two friends can experience the same situation and have completely different emotional responses, based on their disparate perceptions. A classic example is this: let’s say a republican and democrat listen to a republican candidate’s political speech. The republican feels inspired, energized, and thrilled about the proposed policies, while the democrat feels exasperated, even horrified. Same speech, different perceptions, different emotions. We need to be aware of what we think and what we believe. If we’re not aware of our underlying thoughts and beliefs, we can get ourselves into difficult places emotionally and relationally. The first step is to train yourself to become more aware of your thoughts and beliefs. Some people like to do this in counseling, while others find it helpful to journal privately. The key is to be intentional about becoming more aware- this won’t just happen naturally. Next, examine your thoughts and beliefs. Are they true? Are they helpful? Do they serve you and the people you love? If so, great! No need to change your thoughts and beliefs. If not, move on to the next step. The next step is challenging and restructuring your faulty thoughts and beliefs. This is where things really get good- and where it’s incredibly helpful to work with a mental health professional. Your therapist can help you identify cognitive distortions and work with you to find alternative healthy thoughts and beliefs. These new thoughts and beliefs are going to helpful and grounded in reality (not just “positive thinking”). Unhelpful thought/belief: I’ll never get out of this pile of student loan debt. Helpful thought/belief: It will take time, sacrifice, and intentionality, but I have what it takes to pay off my student loan debt. You might make a budget for the first time. You might start actually following your budget for the first time. You might cancel your expensive gym membership. You might work toward a promotion in order to boost your income. You might start a side hustle or pick up odd jobs. Again, this is more than just positive thinking- this is cognitive science in action. Brain plasticity is another topic for different day, but suffice it to say our brains are incredibly powerful and we can literally rewire them and have incredible results in our thinking patterns. To get started on changing your unhelpful beliefs, schedule your first appointment today. If you’re not local to the Twin Cities area, I can help you get connected to a great mental health professional in your city.